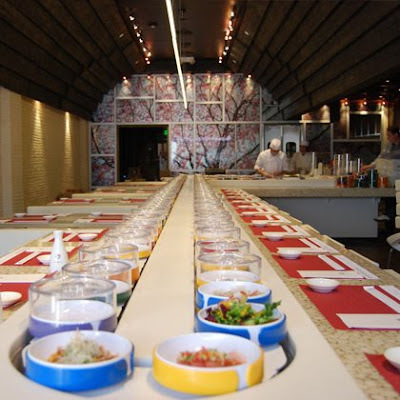 RawFishionado: Kaiten sushi ... in Beverly Hills? In light of my recent post about conveyor-belt sushi, my friend Hector hipped me to the existence of this kaiten place: LuckyFish. Isn't there an oxymoron here, opening a kaiten sushi place, typically set up for affordability and convenience, in Beverly Hills?! And DARNIT, I apparently missed the 1-year anniversary celebration where they were offering up $1 sushi, which some Yelpers posted about. I'm also intrigued by the touting of a high-tech system set up to guarantee freshness: an "RFID tag embeddded in each plate" so that the conveyor "belt automatically discharges any plate that has been rotating for longer than 60 minutes." Has anyone out there been to this Robo-Cop Kaiten place yet? I'd love to get your reviews before I head out there.